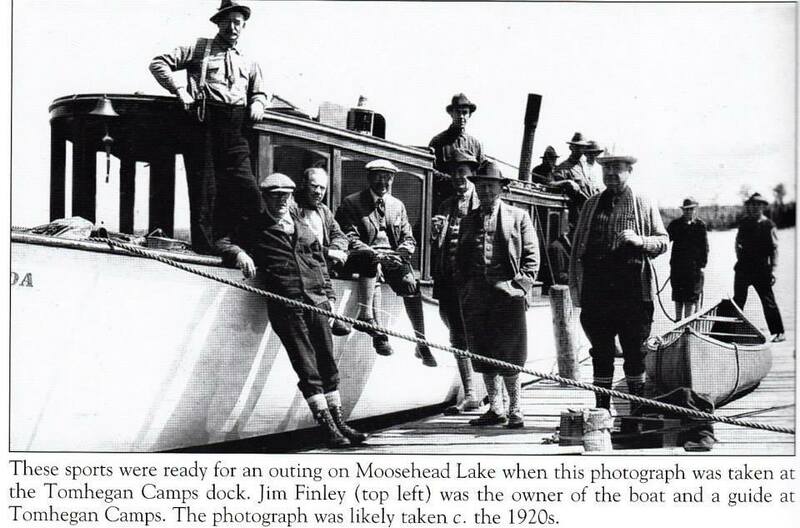 Tomhegan Cabins are located on the northwest side of Moosehead Lake. There are over 100 years of history here. If only the dining room walls could talk, there could be many a book written about the guests that have graced these sporting camps over the years. Let’s start at the beginning. In the early 1900’s, Russell Spinney had graduated from Bryant and Stratton Business College in Concord, N.H., but did not like city living. 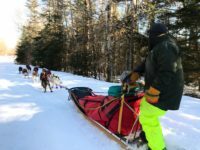 He made his way to the Rangeley area and worked as a guide there at Capt. Barker’s camps. It was there he met his future bride. In February, 1910, Mr. Spinney married Blanche and brought her to this spot, 6 miles over the ice from Rockwood, by horse drawn sled. On the sled was a barrel of molasses, 2 barrels of flour, 1 barrel of salt pork, and other basic necessities. The camps were built in the early 1900’s by the Spinneys and Douglas Rollins. 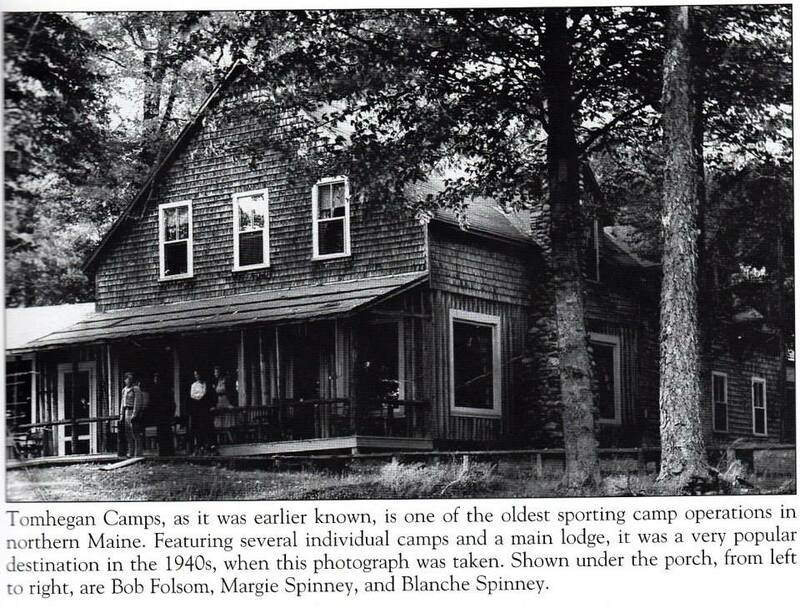 The Rollins family owned the property at that time, but eventually sold the camp and 127 acres to Mr. Spinney. The only access to Tomhegan at that time was by water. In the early years people came to Kineo Station in Rockwood by train and were picked up by one of the forty foot cruisers and transported to Tomhegan. After reaching camp, the guests were catered to by the staff; elegant meals were served three times a day and after the evening meal the guests were provided with a lantern to light their way back to camp. Their fires were started by cabin boys and fresh spring water was brought in. Ferguson Point was named after one of the early guests of Tomhegan. Mrs. Ferguson fell in love with her Indian guide, and being a lady of means, she had several tents erected on this sport with red carpet running between them. It was here that they whiled away the summer days in romantic bliss. 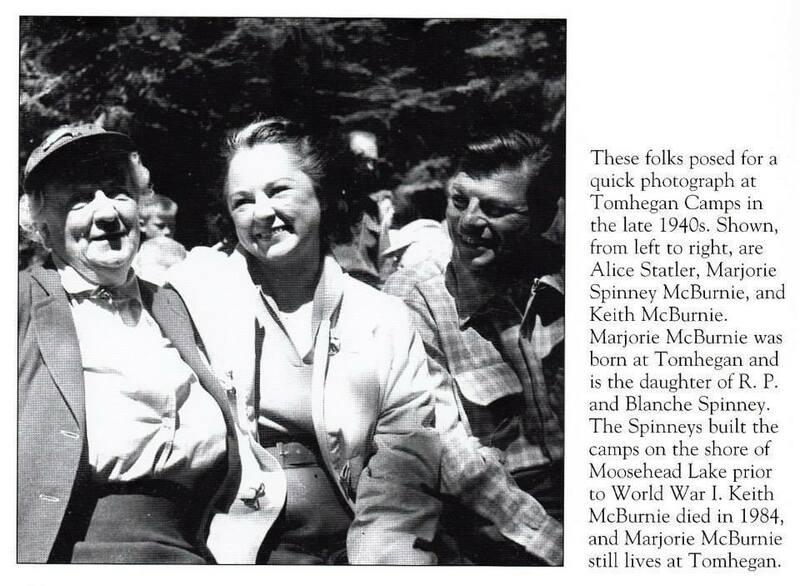 Marjorie Spinney, daughter of Russell and Blanche Spinney, often shared memories of others that have visited here as well; one would be Mr. Gene Tunney, (one-time heavyweight boxing champion), who had a training camp at Baker Point. He spent Christmas with Marjorie’s family, when she was only a small child going to school. Another was Mrs. Alice Statler of the Hilton-Statler hotel chain, who spent the summers here from 1939 until just before her death. 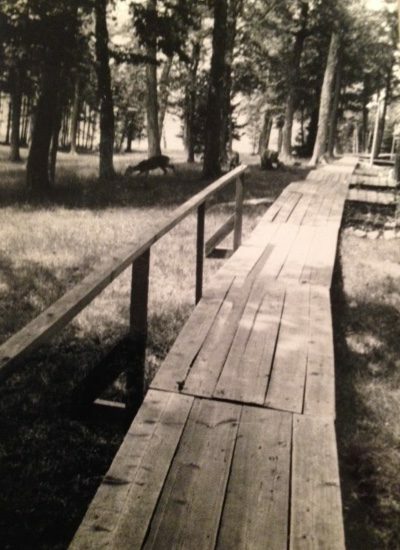 She made a significant contribution to improving the boardwalk, which once stretched one quarter of a mile connecting all of the cabins and the lodge. It was rebuilt courtesy of Mrs. Alice Statler, to make the walk easier as she got older. She had the very best California Spruce brought in to build it, so it would last. However, the Tomhegan boardwalk was regretfully removed in 2012 due to safety issues and deterioration. We know the boardwalk is missed, but we hope the special magic felt at Tomhegan continues regardless. 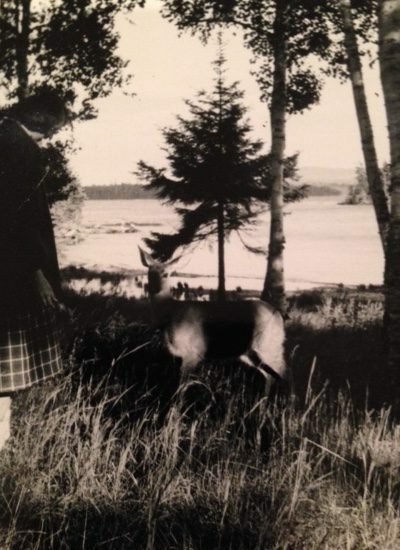 Our guests who have been coming for many years as well as more recent visitors, are all part of the delightful history of Tomhegan. To read more about our history, visit our About Us page.